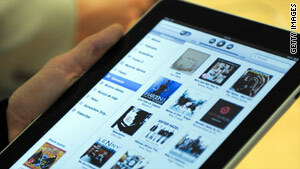 Some colleges and universities are looking to adopt the iPad as a collaborative tool. (ArsTechnica) -- The iPad is about to have its academic chops put to the test this fall in a number of programs around the country. Colleges and universities are looking to adopt the iPad as a collaborative tool, a standardized mobile device to integrate into curriculums, and, in some cases, even a cost-saving device. Oklahoma State University plans to begin a pilot iPad program this fall, with students in certain courses offered by the School of Media and Strategic Communications and the Spears School of Business receiving iPads to use with those courses. The program will be used to determine how effective iPads can be as tools to enhance learning as well as how such mobile devices can be integrated into the workplace. "This limited pilot will be focused on fields of study where we believe we can best determine the higher education value of the iPad," Bill Handy, visiting assistant professor in OSU's School of Media and Strategic Communications, told Macsimum News. "We will evaluate the academic enhancement to the courses, how the iPad and its specific apps and web-based tools can be integrated in this capacity, and perhaps most importantly, how the integration of these mobile tools can expand the tactical abilities of students as they enter the workforce." Though an iPad starts at $499 and can cost as much as $829 for the top-end model, there is potential for cost savings as well. The university has already identified one class where the textbook in ePub format costs $100 less than the dead-tree version. The Illinois Institute of Technology has even more ambitious plans to integrate iPads into academics. A technology initiative will give all incoming freshman undergraduates -- about 550 students -- an iPad to use as a technological enhancement to the curriculum. Because all freshman are required to take several introductory courses, such as "Introduction to the Professions," software, e-texts, and other resources will be uniform for those courses. "We can ensure everyone has the same hardware and software, and it makes it easier to integrate into the curriculum," Evan Venie, associate director of media relations for IIT, told Ars. "But we also want to open it up to other faculty that want to integrate iPad support into their courses -- most of the faculty are very interested in leveraging the potential the iPad offers in the academic environment." Students participating in the test at Darden School of Business, while loving the Kindle for personal reading, overwhelmingly felt the Kindle didn't pass muster in its current state for academic use -- about 4 out of 5 would not recommend a Kindle DX to incoming MBA students. The test also faced a lawsuit from the National Federation of the Blind and the American Council of the Blind over the Kindle's lack of accessibility features, though Amazon has pledged to address that shortcoming sometime this year. Seton Hill University's"An iPad for Everyone" is part of the university's Griffin Technology Advantage Program. Announced just as the first iPads were beginning to ship, the program will put an iPad in the hands of every full-time student starting this fall. Students at George Fox University, which has given a MacBook to incoming freshman for several years, will now offer students a choice between a MacBook or an iPad. "With this, we're basically asking students 'What computing system will work best for you?'" the university's chief information officer, Greg Smith, said at the time the program was announced. North Carolina State University Libraries announced this past spring that it acquired 30 iPads to offer students and faculty for four-hour loans as part of the school's Technology Lending Service. That service offers a variety of devices for loan to students, including laptops, digital cameras, eBook readers, graphing calculators, and more. In addition to browsing the web and "evaluating whether this latest platform is something you want to invest in for the future," the iPads can be used to read some of the 9,000 eBooks NC State recently acquired. Reed College will repeat an experiment that tested student preference of textbooks loaded on a Kindle versus traditional paper textbooks this fall, this time using iPads. Students in the previous experiment preferred the dead-tree edition to using a Kindle DX, despite the obvious advantage of not hauling heavy books all over campus. Expectations are that the iPad will fare better with students than the Kindle did. "If I were to predict, I would say that the results are going to be dramatically different and much better," Martin D. Ringle, chief technology officer at Reed College, told The Chronicle of Higher Education, "and they're going to point the way to what role this technology is going to play in higher education." The iPad can certainly address the speed and input issues that students complained about and offers accessibility features for vision-impaired users. However, the device may suffer from similar problems with loading documents over the air and viewing more than one text at a time. But by combining its speed with the multitasking capabilities that will come in a fall update to iOS 4, the iPad may still prove to be a workable solution. If it works as well as expected, carrying an iPad would sure beat lugging 40 lbs of books and a laptop all over campus.